This Arduino thing is addicting. Recently, we were looking for a new employee time attendance system (the old one went away with the flood) and since almost everything available locally is either garbage or overpriced (often both), I decided we should roll our own. I've heard of the Stronglink SL018 while reading about Arduino libraries. 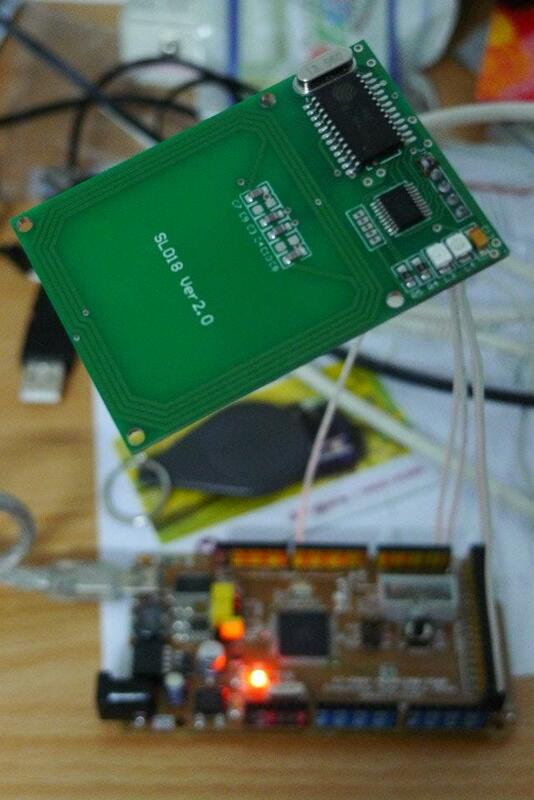 The SL018 is a Mifare reader/writer module that uses I2C. It's available locally for cheap and someone had already written an Arduino library for it. The library had not been updated for 1.0 but I updated it by simply changing a few lines. After hooking the SL018 module to my Arduino, I wrote a little sketch to send the Mifare card's UID to the connected computer over serial port. On the very first try, I discovered I could scan two cards simultaneously by holding the two cards slightly apart, as if holding playing cards. That's not very good for an employee attendance system. Fortunately, the SL018 has a TagSta[tus] pin that simply outputs LOW if a card is present, so I modified the sketch a little bit to ignore further readings unless the TagSta pin has been reset by removing the card. On the computer end, I wrote a little demo program to receive the UID from the serial port, play a wav file, display a jpg image ("employee photo") using the UID as the filename, and record the UID along with the timestamp. I suggested that we could use large LCD TV's instead of a computer to display the employe photos, and the HR people loved the whole setup and idea.